Hume's Tawny Owl is a small to medium-sized owl with a rounded head and no ear-tufts. It is also known as the Hume's Owl. Distribution: Syria and Israel south to both sides of the Red Sea and patchily through the Arabian Peninsula, and locally in southern Iran. Original Description: Hume, Allan Octavian. 1878. Stray Feathers (Str. Feath.) 7: p. 316. 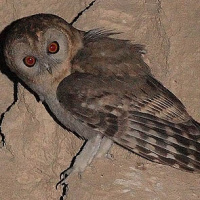 See also: Other owls from Africa, The Middle East, Genus: Strix.